Elton John has announced the end of "The Million Dollar Piano," his second critically-acclaimed Las Vegas residency at The Colosseum at Caesars Palace. The final fourteen shows will occur in the Spring of 2018 with dates scheduled April 28 to May 19, 2018. Tickets go on sale Sunday, Oct. 22 at 10 AM PT. Since February 2004, Elton will have performed 450 shows at The Colosseum to over 1.8 million fans from across the world. His first highly successful five-year Caesars Palace residency "The Red Piano" played 243 shows to approximately one million people through April 2009. 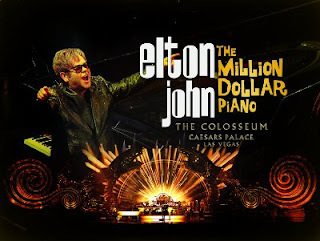 Elton and his band made a triumphant return to Caesars Palace on Sept. 28, 2011, with an all new, second residency production, "The Million Dollar Piano" which has received worldwide acclaim by critics and fans alike and will have played 207 shows at residency's close. "For over a decade, Elton John and his band have graced the stage at The Colosseum at Caesars Palace, performing all the hits that have defined a generation. Elton John's residency at The Colosseum has set the standard for those all that have followed," said Gary Selesner, President of Caesars Palace. "We are incredibly grateful to Elton for allowing Caesars Palace to be the home for his 450 memorable performances." "The Million Dollar Piano" features iconic hits and classic album tracks from throughout Elton's incredible five-decade career, all enhanced by the most elaborate stage design Elton has ever used. At the centerpiece of the performance is the show's namesake piano, an engineering marvel featuring more than 68 LED video screens created by Yamaha.